Alcohol inks are dye based, vibrant pigments that can be used on non-porous surfaces like plastics, vinyl, glass, ceramic materials, Yupo paper, gloss papers and cardstock, canvas, tileboard, metals and more. These inks were originally used in scrapbooking and various other craft projects. Alcohol ink has only been used in fine art creation for a short time; the first documented account being in 2006. I have been using the inks since January of 2014 and teaching the medium since 2015. The inks can only be used on nonporous surfaces because they soak in and evaporate too quickly for many traditional substrates. The main surfaces used are Yupo paper, vinyl, glossy card stock and ceramic tiles. Yupo paper is a synthetic, art and printing paper that has been on the market for over twenty years, but has only recently become widely known and popular with fine artists. Ceramic tiles and tileboard (masonite with a white gloss finish) can be obtained through home improvement centers. Available in many different colors from several manufacturers, the most extensive collection of ink hues, tools and accessories comes from Ranger Ink, a craft oriented manufacturer based in Tinton Falls, NJ. Alcohol based pens and permanent markers are also used seamlessly with the liquid inks. Other manufacturers include Jacquard - Piñata, Copic and Spectrum Noir and others. Creating with alcohol inks is fun, liberating and an exciting adventure! The vibrant colors, varied approaches and happy accidents create interesting effects and outcomes. The inks teach people to go with the flow and let go of their tight-fisted grip on their art. 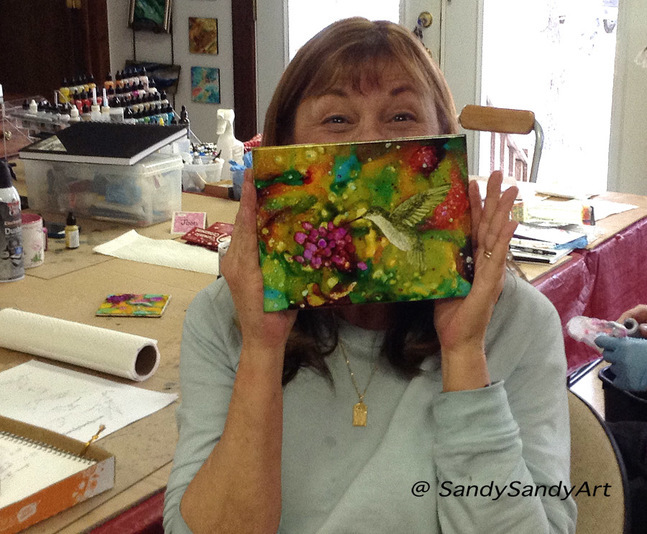 Beginners and seasoned artists alike, benefit from more joy and enhanced creativity. The inks can be a portal to really experiencing the moment and enjoying the process. New inspiration is discovered through exploration and experimentation. I have seen students experience an increased exuberance in life in general through getting involved with the inks. People love the freedom of expressing art their own way through this varied and unique art process. You can see my artwork done in alcohol ink here on my blog and in various sections on my website. 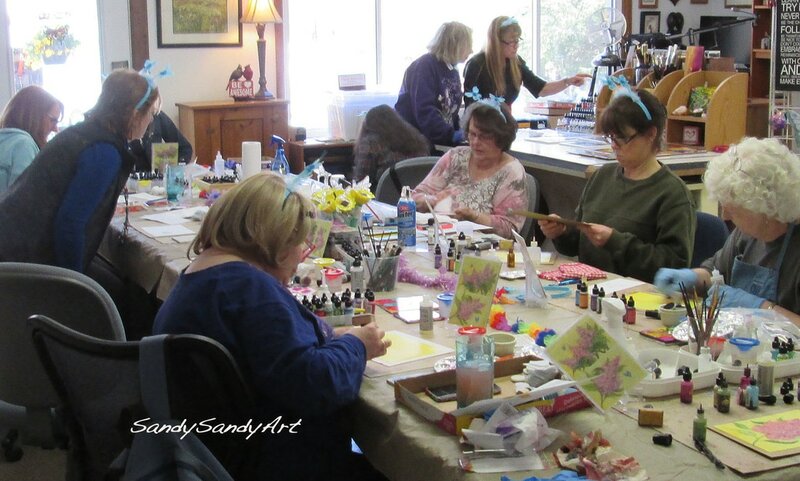 Find out more about working in alcohol inks, the tools, supplies and benefits through my website pages on physical classes and workshops. More information is available about online courses and you can see a short time lapse video showing some of the various tools and techniques used in creating with alcohol inks here. 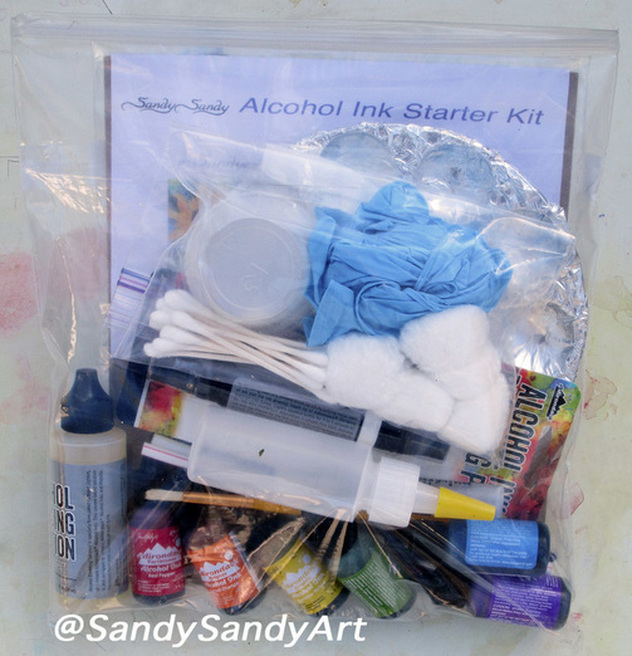 Alcohol Ink Starter Kits Are Available For Sandy's Students. "Thanks so much for the entire day! It was really fun!! I'm looking forward to the next one already!" ~ Jeannie D.